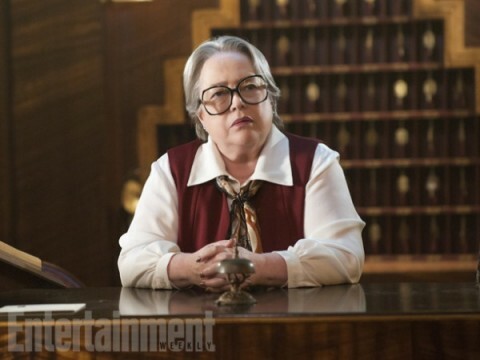 As far as I’m concerned, all TV shows should involve Kathy Bates in one way or another. Apparently Chuck Lorre has this sentiment as well, because he and Bates are teaming up for the Netflix comedy series Disjointed. Disjointed will star Bates as a marijuana advocate who becomes the owner of a Los Angeles cannabis dispensary. The half-hour show will use a multi-camera format, thus setting it apart (a little) from other pot-based shows like Weeds. Bates will be joined by characters including three “budtenders” (according to the show’s logline), her twenty-something son, and a “deeply troubled” security guard. The logline goes on to tell us that everyone is pretty much constantly high, so I guess we know what to expect on that score. Presumably Lorre’s presence, as well as the fact that Bates’s character is getting to operate legally, will mean that Disjointed is more of a straight comedy. But Lorre naturally has his detractors, and is not always dependable in producing shows that everyone likes. It’s still too early to tell how this one will turn out, but hopefully Bates will make up for any trepidation we might feel about getting yet another show from him. I’m always a fan of Kathy Bates, so I’ll at least be checking this one out when it hits Netflix. While the premise is not entirely intriguing, there’s some potential there. I just hope that the show shies sway from never-ending pot jokes and manages to get something more substantial into the mix. Kathy Bates deserves it, as do the viewers. Netflix certainly has faith in the series, and has ordered a full twenty episodes. As yet there’s no clear premiere date for when Disjointed will make its way onto the small screen, but we will certainly be there when it does.